April | 2013 | LIT.GAZ. 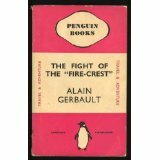 Another of my cerise Penguins here, from 1938, and one I didn’t know about until I found it at a wonderful secondhand bookshop – Aardvark Books – in Southern Shropshire/ Herefordshire. I knew about Gerbault‘s curious nautical nomadism from reading the early books of my favourite travel writer Ella Maillart; she did some sailing in the 1920s and knew Gerbault (she and her friend get a very brief, anonymous mention in this book). He tells of his single-handed journey through storms and hurricanes as he sailed from Gibraltar to New York in 1923, one of the very first to make the journey single-handed. His love of his boat is evident, and there’s lots of information that only sailors will make sense of, but the adventure, the thrill, the enjoyment and the dangers are all graphically conveyed in this account; his love of solitude is very clear, though harder to understand, until perhaps one reflects that he is another of those young people perhaps indelibly marked by their experiences in the Great War. Another of my favourite relaxation genres is detective fiction. For me, Sherlock Holmes is the greatest, and I’ve read and re-read, and listened repeatedly – I think one of the good things about a well-crafted detective story is that over time sufficient of the plot should become vague enough in one’s mind to allow re-reading without the ending being too obvious too soon. Along with Sherlock Holmes, I have developed a liking for Ellis Peters‘ Brother Cadfael novels over the years. They are well-crafted, and the setting is very convincing – possibly riding on the back of Eco‘s Name of the Rose? – mediaeval and monastic, with a hero with a past to make him interesting, and the Shropshire setting, which is an added attraction for me as I grow to know and appreciate the area. So, I recently re-read One Corpse Too Many. It’s one of the very early ones, so the characters are still developing and have a way to go before they become fully fledged and settled as they are later in the series. There’s rather less about the daily life in a mediaeval monastery and town than we get later on, too. Peters fascinates on several levels – she weaves in historical detail effectively and convincingly – though as I’m no expert on twelfth century England, I don’t know how accurate she is; she recognises that there are similarities and differences between human beings and their behaviours over the centuries, and she manages to make us care briefly about her characters. I imagine readers have their own version of what I call ‘eye candy’ – lighter books that they read when on holiday, ill or in need of a change. I’ve added PG Wodehouse‘s Blandings novels to my list, prompted largely by the recent BBC Television series which I really enjoyed. They are trivial, silly and a lot of fun. The plots are very far-fetched and often full of holes, but the language is superb, with lots of hidden references to delight this reader. And then, there is trying to work out in which real places the stories are set. The stories are peculiarly British, as are the characters, and the era of the vague 1920s is effortlessly created. I think Uncle Fred is my favourite character, although on TV I really enjoyed Timothy Spall as Lord Emsworth. Thoroughly recommended as holiday reading.